When Soo began her tenure as one of our first WWIN Star Scholars, she exemplified the traits and characteristics we look for in a WWIN woman. She was determined, tenacious, courageous and had a clear plan to complete her college journey. 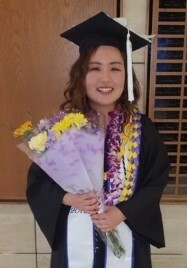 Coming from South Korea with little support from her family, and little knowledge of the English language, she was determined to be the first in her family to earn a college degree. Her experience as a cross country runner provided her with an understanding of what it meant to achieve her goal. She knew that it would take a strong work ethic, focus, and the support of her teammates to challenge and empower her to succeed. With the financial support and mentorship, she received from her classmates and her silent cheerleaders at WWIN she achieved her goal. To add to this good news, Soo just contacted us to let us know that she has landed a job with Nordstrom in Seattle as a Recruiting Coordinator! It is so exciting to watch the women of WWIN achieve their dreams and change the world.